Distance: 4½ miles; Ascent 1065ft; Duration 3½-4 hours Meet at 10:30am in Cat Nab car park (NZ 668 215) at Saltburn. This is a pay-and-display car park, so have plenty of change with you. Our route takes us past the Ship Inn (one time home of the mastermind behind the local smugglers) onto the cliff-top plateau. Here we complete a circular route using the Cleveland Way National Trail, together with field paths and farm tracks. Heritage along the way includes the Coastguard cottages, a Roman signal station, the Guibal fan house and metal sculptures. 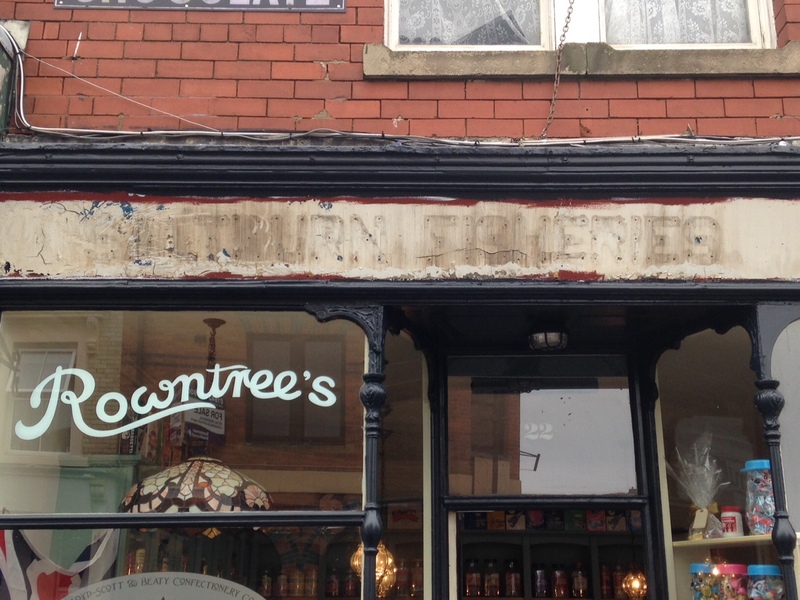 These old shop signs have been revealed by recent work on 17 Milton Street. “Fruiterer &” above the left window. 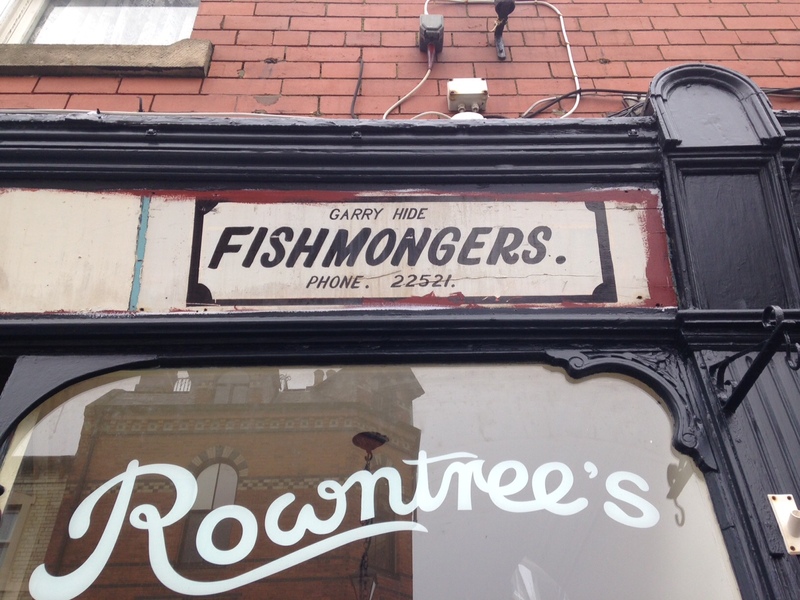 “Ironmongers” above the right window. A family member recalls that the hardware store was called run by a family called Fletcher. This building is currently occupied by the Saltburn Evangelical Church, although it’s 1887 date stone show its earlier incarnation as the Friends Meeting House. It makes sense there would be a Quaker presence in Saltburn due to the influence of Henry Pease. Quaker worship started in Saltburn during 1869, an Allowed Meeting was created in 1873. It became a full Preparative Meeting in 1885 two year before this building, the Meeting closed in 1914. 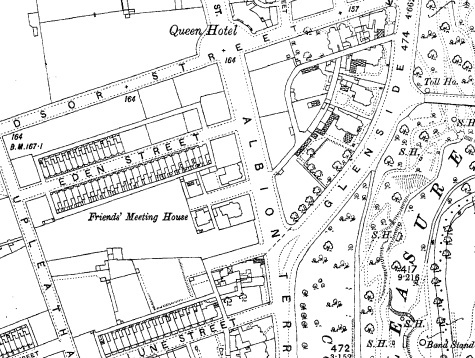 The meeting house actually pre-dated the building of Leven Road as that doesnt exist on early maps. I’m fairly certain this is a stench pipe judging from its similarilty to other local ones, its the first i’ve seen in Saltburn though. The railway lines at Saltburn originally extended directly into the back of the Zetland Hotel as can be seen in this 1950s photo from the East Cleveland Image Archive. There used to be a pedestrian subway to get under the lines at the rear of the main station. There is a beam stamped with the date 1865, but it cannot now be seen as the area is within someones private garden. yogi59 has kindly allowed me to use the following photo which shows the subway being filled and the date stamped beam.